"The first day, a messenger from the municipal judge went house to house summoning us to a meeting right away. There the judge announced that the reason for the meeting was the killing of every Tutsi without exception. It was simply said, and it was simple to understand. So the only questions were about the details of the operation. For example, how and when we had to begin, since we were not used to this activity, and where to begin, too, since the Tutsis had run off in all directions. There were even some guys who asked if there were any priorities. The judge answered sternly: "There is no need to ask how to begin. The only worthwhile plan is to start straight ahead into the bush, and right now, without hanging back anymore behind questions." "During that killing season we rose earlier than usual to eat lots of meat, and we went up to the soccer field at around nine or ten o'clock. The leaders would grumble about latecomers, and we would go off on the attack. Rule number one was to kill. 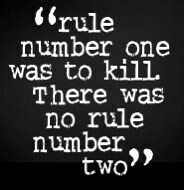 There was no rule number two. It was an organisation without complications." "The plane came down April 6. A very small number of local Hutus went straight for retaliation. But most waited four days in their houses and in the nearest cabarets, listening to the radio, watching Tutsis flee, chatting and joking without planning a thing. On April 10 the burgomaster (mayor) in a pressed suit and all the authorities gathered us together. They lectured us, they threatened in advance anyone who bungled the job, and the killings began without much planning. 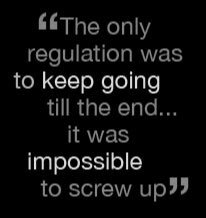 The only regulation was to keep going till the end, maintain a satisfactory pace, spare no one, and loot what we found. It was impossible to screw up." "On April 11 the municipal judge in Kibungo sent his messengers to gather the Hutus up there. Lots of interahamwe had arrived in trucks and buses, all jostling and honking on the roads. It was like a city traffic jam. The judge told everyone there that from then on we were to do nothing but kill Tutsis. Well, we understood: that was a final plan. The atmosphere had changed. That day misinformed guys had come to the meeting without bringing a machete or some other cutting tool. The interahamwe lectured them: they said it would pass this once but had better not happen twice. They told them to arm themselves with branches and stones, to form barriers at the rear to cut off any escaping fugitives. Afterwards everyone wound up a leader or a follower, but nobody ever forgot his machete again." “Killing is very discouraging if you yourself must decide to do it, even to an animal. But if you must obey the orders of the authorities, if you have been properly prepared, if you feel yourself pushed and pulled, if you see that the killing will be total and without disastrous consequences for yourself, you feel soothed and reassured. You go off to it with no more worry."